Great Lent is often described as a "pilgrimage" or journey. Though obviously not "wrong," it seems somewhat imprecise. There are multiple sources for the journey/pilgrimage metaphor. For example, in the traditional Western lectionary for Lent Exodus is read, in lectio continuo style, combined with penitential processions and pilgrimages, accompanied by Psalmody, in hope of reaching of Jerusalem, the city of peace, wishing to see Jesus ( John 12:21 ), thus being able to receive the edification of those able to ask have you not know the things which happened there in these days? ( Luke 24:13 ). As with St. Zosima, the experience of Pascha is rooted in leaving one's abode, wandering alone in the desert, and finding refreshment in the great synaxis of the community. The imprecision of this approach, however, comes to one's attention through Step 3 of The Ladder , where the Greek word for "exile" may also be rendered "pilgrimage." The underlying notion is that exile is not a categorical or nominal state. Exile is an apostolic state, a condition into which one is sent either for salvation, as Lot and his family are exiled from Sodom (cf. St. John Climacus, Step 1 ), or, having been taken captive by sin, for repentance , as Israel by the king of Babylon. Applying the concept of experiencing exile to the the experience of Lent, brings on into a starker, more direct notion of the nature of the Lenten fast. Specifically, the condition of fallen humanity as being in exile from the presence of God, of being cast out of Eden ( Gen. 3:24 ). It is the typology of the Fall itself that is the more accurate theme within the Eastern Lenten Lectionary, in which Genesis, Proverbs, and Isaiah are featured. By construction of Lent as an exilic experience, is to take Lent as an encounter with the self as an alienated creature, a realization of being subject to utter Death, and in terror of being driven from the face of the ground itself ( Gen. 4:14 ). From this encounter, the self is to learn wisdom, and to find the hope necessary to clean house, purifying itself so that once again it may become a worthy location for the Temple of God to be established ( 1 Cor. 3:16 ; 1 Cor. 6:19 ). In this conception, it is the Church, Nineveh, that responds to the prophet, undertaking profound mourning over the threatened loss of life due to sin, then repenting with tears and ashes, seeks the mercy of God, a writ authorizing continued struggle, and a reprieve from Death ( Jonah 3:4-10 ; Nahum 3:1-7 ). In such agony, the soul acquires the mark that signs it as set apart for God, though living in a wandering exile ( Gen. 4:15b ). It is better to live in exile, in a solitary life, faithfully, yet under the crown's protection, than execution before the throne for treason. Living in exile, Lent becomes a project to appropriate the wisdom necessary to live out life in the wilderness, the desert of the world. The artifacts of acquired wisdom are the statutes and precepts needed for daily life. Good order in one's labor is a light to the understanding. There is nothing like knowledge. Let every prayer that you offer in the night be more precious in your eyes than all your activities of the day. Do not weigh down your belly, lest your mind become confused and be troubled with mental wandering when you stand up a night, lest your members be enervated and you find yourself filled with womanish languor. Nay more, lest, while your soul is darkened and your thoughts turbid, you should not be able to collect your thoughts at all in your psalmody on account of that darkness ( St. Isaac the Syrian, Homily 64 , 450). Indeed, for those living in the knowledge of Christ, the focus of these precepts is not the Law of community, the Desert law books of Moses: Exodus, Leviticus, euteronomy, and Numbers, rather it is the modest Domestic wisdom needed to manage daily relationships among people. Hence, the Eastern Lectionary stresses Proverbs; neither should one pass over Ecclesiastes, the Wisdom of Solomon, or the Wisdom of Sirach. The task of seeking domestic wisdom from God is the common work of everyone who would wish to be set apart from the World, to understand God with us, thereby realizing the mercy of Baptism. In short, seeking domestic wisdom is to practice the Liturgy of the Presanctified Gifts , the common work of the Baptized, in which, as exclaimed before the reading from Proverbs , The Light of Christ illumines all! The operative concept in this construction is "gifts" or "offering." This is very different from the practice of alms giving. Alms are a voluntary step toward poverty, a renunciation of grasping after the illusions of worldly benefit and advantage. Renunciation of claims of the world that are set against the claims of God is necessary, of course, as by withdrawing from the world out of love for God [one] has obtained fire at the very outset; and like fire set to fuel, it soon kindles a larger fire ( St. John Climacus, The Ladder, Step 1 , p. 56). The fire of compassion kindled is such that nothing can bring the heart so near to God as almsgiving, and nothing brings such serenity to the mind as voluntary poverty. It is better to be called an ignoramus by the many because of the generosity of your hands and your measureless liberality because of your fear of God, than to be called wise and sound of mind by reason of your niggardliness ( St. Isaac the Syrian, Homily 4 , p. 150). Rather, the Presanctified Gift is the voluntary dedication of self to God, the recognition or self-understanding that one has life only and exclusively through the permission of the Master with whom one has entered into a voluntary contract, or covenant, of servitude, or more accurately translated, slavery ( Philippians 1:1 ). By accepting the task of learning from Christ, becoming disciples, we, as Paul, are also sent as agents into our daily life ( Matt. 28:18-20 ) : a bondservant of Jesus Christ, called to be an apostle, separated to the gospel of God which He promised before through His prophets in the Holy Scriptures, concerning His Son Jesus Christ our Lord, who was born of the seed of David according to the flesh, and declared to be the Son of God with power according to the Spirit of holiness by resurrection from the dead ( Rom. 1:1-4 ). In this framework, baptism seals the contract by which one becomes a slave of God. In ancient times, this was not a metaphorical expression. Selling one's self, and one's family, was the ordinary way of escaping debt accumulated beyond one's ability to pay. In short, and in modern terms, it was the ordinary outcome of a bankruptcy proceeding. The entire witness of Scripture makes clear that the amount of human indebtedness to God is incalculable, and beyond that, even if it could be paid at some material level, God has not use for such material expression ( Ps. 50 ; Isaiah 40 ). The starting point for a Christian life, there is not merely that one is exiled to the territory of Death, but, beyond that, during our life in exile, one has so mismanaged affairs as to become bankrupt. The only hope for relief from this double exile is to become a slave of God. The mind rebels against such a notion. This rebellion is the fantasy that, while slave, there is some freedom of will, of mind, of body. More than fantasy, such is the insane gluttony, indulgence of self, as possessed the mind of Adam and Eve, that there is anything whatsoever beyond what God has granted. This is a false pride of self-possession, for by becoming slaves, any freedom is itself a gift of mercy and compassion by the Master. Lenten practices acknowledge this precise reality. The disciplines ask that all upon which we make a claim be given away. The basis for this claim is that, as slaves, we own nothing, and so it must go to those to whom the Master directs, we are to take no thought as our own, but make every effort to confine and to conform our thoughts to the thoughts of the Master, and we are to give up the conceit of the body, it is not our to use, but to be kept clean and ready for the Master's use. At first this radical surrender of self, recognition of one's estate as slaves, sounds repugnant and hateful. Indeed, so long as the focus is on the self as self, it is abhorrent. What makes our condition not only tolerable but desirable is the character, or essential nature, of the Master Himself. He reveals this nature as a gift, and this self-revelation gives life, that is the energy necessary to accomplish His purposes. The essence of God is love; the purpose of God is life eternal. It is the Master's will that each participate in both love and life. That we don't participate fully reflects the delimiting character of our subscription to the fallen estate. However, due to His compassionate gifts that arrange our domestic conditions to produce whatever goodness, whatever kindness, and whatever gentleness experienced as part of the suffering that is human existence, we have hope, and to the extent realized, joy. The realization of the experience of love, hope, and joy mirror the fact that God has no need that can be satisfied by material sacrifice and is likewise unable to take pleasure in the exercise of material authority and power: O God, in the sanctuary is Thy way. What God is as great as our God? Thou art God Who workest wonders ( Ps. 76:13 ). Needing neither vengeance, nor slaves, nor power not His own, God, who is authentic Love, has mercy on the debtor and compassion on those who suffer, releasing both and converting those who desire to reciprocate His love into sons and daughters: I poured out my soul within me, for I shall go to the place of the wonderous tabernacle, even to the house of God, with a voice of rejoicing and thanksgiving, yea, of the sound of them that keep festival. Why are thou cast down, O my soul? And why doest thou disquiet me? Hope in God, for I will give thanks unto Him; He is the salvation of my countenance, and my God. ( Ps. 41:4-6 ). Indeed, it is the praises for goodness and greatness of God with which Elihu counsels Job ( Job 36:1-37:24 ), as prelude to God's direct interrogation of Job, which the Eastern Lectionary provides for Holy Week Thursday Vespers. The emphasis in the relationship with God is on the requiting of Love with Love: If anyone love Me, he will keep My word; and My Father will love him, and We will come to him and make Our home with him. He who does not love Me does not keep My words: and the world which you will hear is not Mine but the Father's who sent Me. ( John 14: 23-24 ), for No longer do I call you servants, for a servant does not know what his master is doing; but I have called you friends, for all things that I heard from My Father I have made known to you. You did not choose Me, but I chose you and appointed you that you should go and bear fruit, and that your fruit should remain, that whatever you ask the Father in My name He may give you. These things I command you, that you love one another. ( John 15:15-17 ). To this precise point, it seems worth noting that one early ascetic movements within the early Church were the parallel Daughters of the Covenant and Sons of the Covenant. Often married, these ascetics sought to expand their baptismal vocations and lives in society, to embrace a difficult path refocusing on the singular activity on giving love. Reciprocating the God's love is the work of purifying not only one's mode of life but most especially the thoughts of one's mind and of one's heart. This work requires more than obedience outer laws, but obedience to the commandments of love for the sake of God. The great summary of the Law, to love God with all one's heart, mind, and soul, and one's neighbor as one's self, is too constraining, and does not result in purification, for not only one's neighbor, the wounded stranger one encounters on the way ( Luke 10:28-37 ), but that neighbor is one's enemy for I say to you who hear: Love your enemies, do good to those who hate you, bless those who curse you, and pray for those who spitefully use you. To him who strikes you on the one check, offer the other also. And to him who takes away your cloak, do not withhold your tunic either. ( Luke 6: 27-30 ). In so commanding, the Gospel not only forbids evil, it prohibits the thoughts which become the cause of your deeds ( John the Solitary, On the Soul, p 12). Regarding those who cannot do this, not even so far as to patiently endure a single blow, St. Anthony the Great instructs his disciples 'Make them a little soup, for they are sick' and he said to them: 'If you cannot do this and you will not do that, what am I do do for you?' There is need of much prayer. ( Give Me a Word: the Alphabetical Sayings of the Desert Fathers , p. 35). In this, it is important to understand that one's enemies are contained in every cause that draws one's attention away from God. Resisting one's enemies is difficult, requiring training, or, technically, ascetical practice, that, by incorporating the grace of God, strengthens to the will to more than stand, but to act in love against them. It is the ascetic search for purity that transforms the experience of affliction into a light to the world, as the struggle against such enemies is beyond human power, and made possible only through a life that comes from Christ. Lenten practices acknowledge this precise reality, it aim, to beckon those who would be wise, not to a sterile virginity, but, as lamps, to receive the light of new fire. 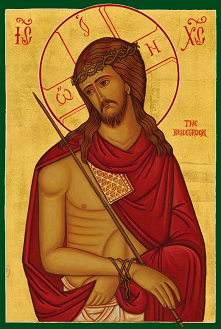 From the foregoing exploration the consideration of Lent from perspective of life in exile is both consistent with the customary Orthodox practices and makes available precisely the authentic ascetic formation by which believers receive crowns as sons and daughters of the King.